Left: front cover of the original album, as released by Mercury in 1988. Middle & right: front and back cover of the MTM Classix reissue (2005). As a teenager, Norwegian Aina Olsen was discovered by PolyGram Records and she recorded her debut album ("Into Pieces") when she was only seventeen. Two other albums followed, the hard to find "Target Practice" in 1985 and this here "Living In A Boy's World" in 1988. After intense efforts and thanks to the help of Magnus Söderkvist (ex-MTM Music, now Atenzia Records), the guys at MTM Music were able to track down Aina in L.A., where she's now active as a photographer. 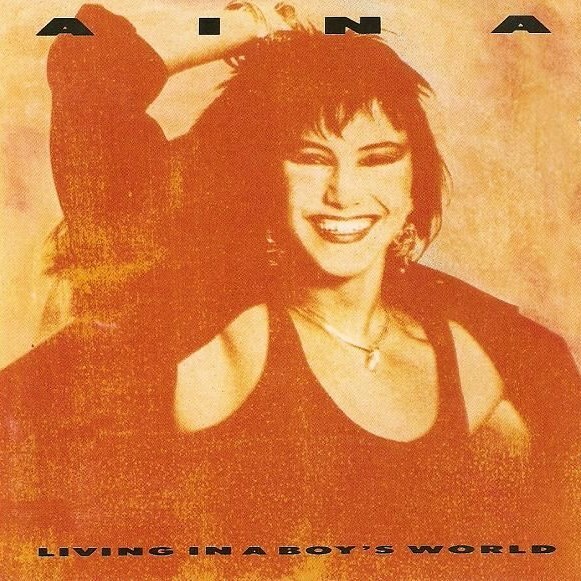 If you're an AOR addict and you don't own a copy of "Living In A Boy's World", you really should take the chance to purchase this re-issue, not only for the fantastic original ten tracks (that have been digitally remastered), but also for the (no less than) five powerful bonus tracks, all being demos recorded with Bob Marlette and Tom Whitlock: "Save Me Father", "It's Raining It's Pouring", "Too Good To Be True", "If I Can't Have You" and "Shake You Good". Over 60 minutes of pure AOR heaven. If only she could make a comeback, like Robin Beck did!